Spend your vacation in a new, modern and fully equipped apartment in the center of Zagreb. Great location in the best neighborhood - just a few minutes walk from the main square (Ban Jelacic Square). It is located through the pavilion Meštrović. Recently renovated, fully-equipped, spacious apartment on the 5th floor of a building on a great location in the center. The apartment is exceptionally quiet. The apartment is located close to the main square in Zagreb, main station, shops, styled bars, parks, etc. The apartment is 1 km away from the bus station and the train station. The apartment has one bedroom, anteroom, fully equipped kitchen and bathroom. The bedroom has a double bed (160x200 cm), wardrobe, nightstand with lamps. In the living room there is a comfortable couch that can be converted into a double bed, a four seater desk, air conditioning and an LCD TV. The kitchen is equipped with all the necessary appliances during your stay. The apartment is also equipped with central heating system with thermostat, free WiFi, cable TV, clean bedding, clean towels and hair dryer. Apartment Zagreb "ZAGI" City Center is located in Zagreb, 800 meters from the Archaeological Museum. The apartment is 800 meters away from the Ban Jelacic Square in Zagreb. Guests can use free Wi-Fi throughout the property. King Tomislav Square and Dolac Market are 800 meters away. From the apartment "ZAGI". To Zagreb Airport - Franjo Tuđman is 10 km away. Lower Town is an excellent choice for travelers who are interested in architecture, exploration of the Old Town, and Food. This is a favorite part of "Zagreb" destination for our guests, based on unbiased reviews. This property also has one of the most popular locations in Zagreb! Guests are happy with this property from other nearby apartments. This property is rated for the best value for money in Zagreb! Guests have a higher value for money than other facilities in this city. It is possible to arrange transport from the airport to the apartment for an extra charge. my life motto is: Live, Love, Laugh and Travel as much as you can!!! Apartment Zagreb "ZAGI" City Center is located in Zagreb, 800 meters from the Archaeological Museum. 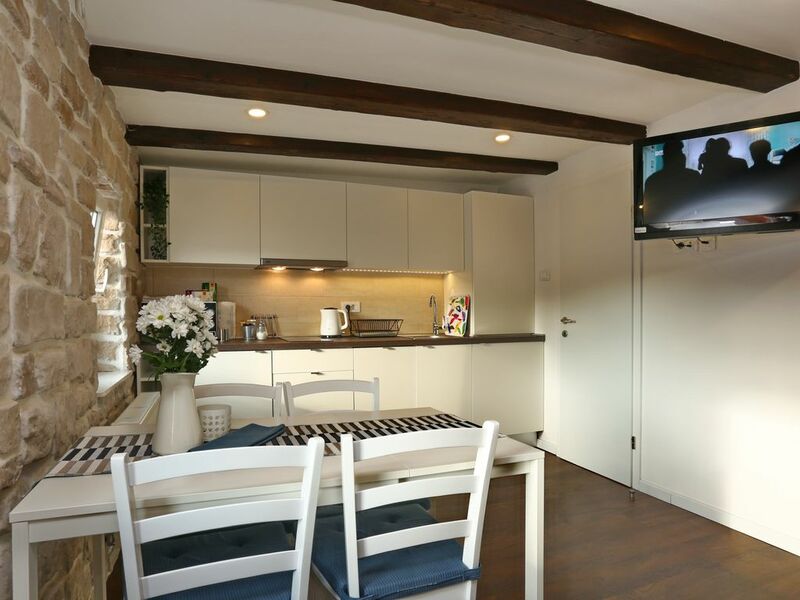 This air-conditioned property is 800 meters from Ban Jelacic Square in Zagreb. Guests can use free Wi-Fi throughout the property. The kitchen is equipped with a dishwasher. As part of the Zagreb ZAGI City Center, there are also towels and bed linen. The private bathroom has a shower. King Tomislav Square and Dolac Market are located 800 meters from Zagreb's "ZAGI" City Center Apartments. To Zagreb Airport - Franjo Tuđman is 10 km away. Donji Grad is an excellent choice for travelers who are interested in architecture, exploration of the Old Town, and Food. This is a favorite part of 'Zagreb' destination for our guests, based on unbiased reviews. This property also has one of the best rated locations in Zagreb! Guests are more satisfied with this facility than other facilities in the surroundings. This property was also rated for the best value for money in Zagreb! Guests make greater value for money than other facilities in this city. Parking Public parking is available near the property and no reservation is required. Parking fee is 9 EUR per day. What a charming little flat! We loved its character with the exposed beams, and the great location, walking distance to everything we wanted to see in Zagreb. Super clean, very comfortable, and located just around the corner from an amazing coffee shop. It's a 5th floor walk-up (no lift) so be prepared for a little exercise as well. But it's really lovely up under the wooden beams. It was so fresh, it felt like we were the first to stay there! Wonderful. Beautiful apartment on the top floor. Not many linens available if you planning on a guest using the pull out couch. Otherwise a very clean and nice apartment . The reservation was made for one night and two people. And everything was prepared and set up so. Very nice apartment near shops and restaurants! This apartment was VERY clean, modern, and safe. Communication was great, and everything ran smoothly. Will definitely stay here again upon our return to Zagreb! This place is so cute and in such a great area. Close to restaurants, shops and historic sites. It's quiet and having a wash machine was incredibly convenient. Would definitely recommend this apartment to others staying in the area. We thoroughly enjoyed our stay in this apartment in Zagreb. It is in a great location near to all the necessary attractions and lots of restaurants, bars and coffee shops. The apartment is spotlessly clean. It appears to have been newly renovated and it seemed like we may have been the first people who have stayed there. If not, great cleaning job. Nice bedroom, bathroom with big shower, kitchen and living area. Equipped with all you could need. The only problem is that it is located on the 5th floor. There is no elevator. It was fine for us, but quite a hike upstairs each time you go out. Not the place for elderly people or anyone with mobility issues. Otherwise, great place and we highly recommend it.